When I am looking for unusual virtual instruments that are simple to use and somewhat unique, Modwheel's website is almost always my first port of call. 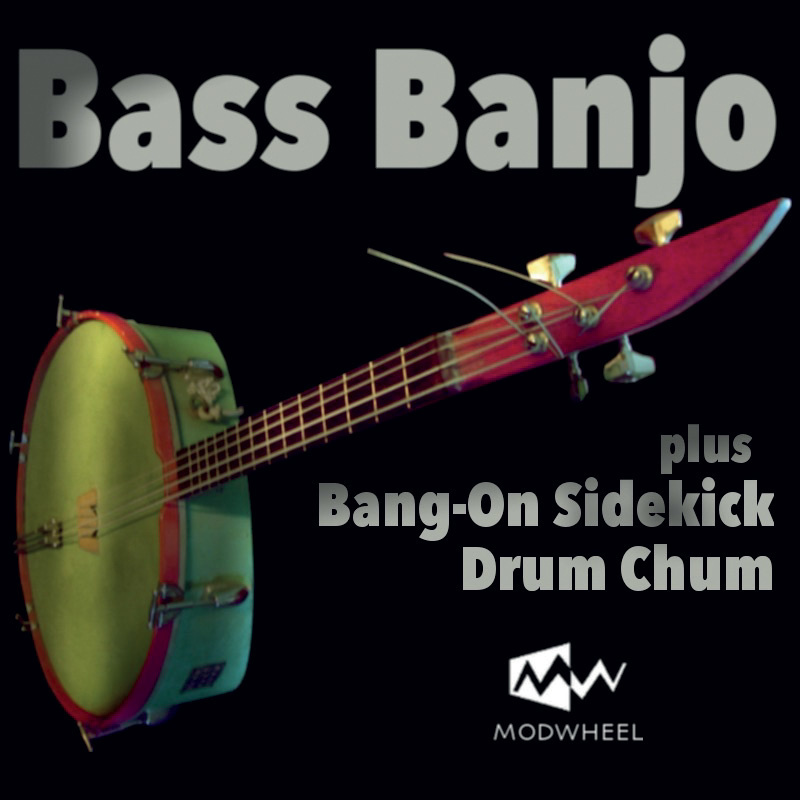 Their latest offering, Bass Banjo, is based on a bespoke instrument originally built by one of Modwheel's founders, David Donaldson, together with collaborator Stuart Porter, for performance duties with an outdoor marching band. The pair made the instrument by combining a bass drum with a modified double bass fingerboard. Having thoroughly sampled this curious instrument, Modwheel ended up with a 2.2GB core library of sounds (reduced to 1.07GB using NI's lossless compression facility), including four round-robin variations and multiple articulations. They then created 10 separate Kontakt interfaces to segregate various performance methods. 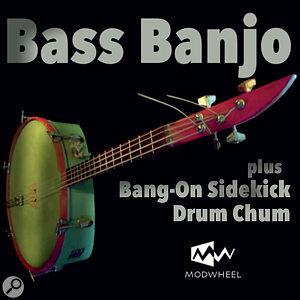 For example, five of the interfaces are home to what Modwheel call Bang‑On Sidekick percussion sounds, which were created by striking the drum in various ways rather than plucking the instrument's strings. Generally I prefer Kontakt instruments to have a single interface so that everything is in one place, however Modwheel's approach makes it possible for each interface to be elegantly simple. The first of the interfaces is built using the basic bass banjo notes, which are not entirely inspiring on their own, but it does provide plenty of ways to process and develop them. Its Oomph control adds a tightness to the bottom end, Heat introduces tape saturation, Note Off controls the level of the finger noise on the fretboard and moving the modulation wheel adjusts the level of the performed slap. There is also a 32-step arpeggiator, a reverb and a delay. In addition to all this is a set of keyswitch controls that govern the articulations, so that the user can decide whether or not they want sustain, staccato, muted or mildly percussive 'chopstick' notes. The second interface has been given exactly the same controls at the first, but offers soprano sounds that are nearer the register of a traditional banjo. Interfaces three to seven serve up a wide variety of percussive sounds and looping patterns. Amongst the octaves are a mixture of string scrapes, dampened drum hit, rattles, tones, taps and grooves, enabling the user to quickly create something approaching the rhythmic arrangements of Tom Waits' Swordfishtrombone, or those at the end of Mike Oldfield's Ommadawn (Part One). Once again, there are plenty of sound processing tools to try out, many of which are the same as those given to the first two interfaces, the main difference being that several of the percussive variety include a phaser in place of the keyswitch controls. The final three interfaces provide synth sounds which, with names like JamJarre and Bangelis, leave little doubt as to which musicians inspired them. These too include a phaser rather than keyswitches. Virtual instrument shoppers might not immediately be tempted by the idea of a bass banjo, but this very affordable product has a lot to offer in terms of percussive possibilities, sound processing and synth sounds. My advice is to give it a try and see where it takes you.